Whether you are running your site on your own server or in the cloud, security must be at the top of your priority list. If so, you will be happy to hear that IIS has a security feature called the application pool identity. This feature was introduced in Service Pack 2 (SP2) of Windows Server 2008 and Windows Vista. An application pool identity allows you to run an application pool under a unique account without having to create and manage domain or local accounts. The name of the application pool account corresponds to the name of the application pool. The image below shows an IIS worker process (W3wp.exe) running as the DefaultAppPool identity. Worker processes in IIS 6.0 and in IIS 7 run as Network Service by default. Network Service is a built-in Windows identity. It doesn't require a password and has only user privileges; that is, it is relatively low-privileged. Running as a low-privileged account is a good security practice because then a software bug can't be used by a malicious user to take over the whole system. However, a problem arose over time as more and more Windows system services started to run as Network Service. This is because services running as Network Service can tamper with other services that run under the same identity. Because IIS worker processes run third-party code by default (Classic ASP, ASP.NET, PHP code), it was time to isolate IIS worker processes from other Windows system services and run IIS worker processes under unique identities. The Windows operating system provides a feature called "virtual accounts" that allows IIS to create a unique identity for each of its application pools. Click here for more information about Virtual Accounts. If you are running IIS 7.5 on Windows Server 2008 R2, or a later version of IIS, you don't have to do anything to use the new identity. For every application pool you create, the Identity property of the new application pool is set to ApplicationPoolIdentity by default. The IIS Admin Process (WAS) will create a virtual account with the name of the new application pool and run the application pool's worker processes under this account by default. Select the Identity list item and click the ellipsis (the button with the three dots). Select the Built-in account button, and then select the identity type ApplicationPoolIdentity from the combo box. You can try this by selecting a file in Windows Explorer and adding the "DefaultAppPool" identity to the file's Access Control List (ACL). Select a file or directory. Enter IIS AppPool\DefaultAppPool in the Enter the object names to select: text box. By doing this, the file or directory you selected will now also allow the DefaultAppPool identity access. You can do this via the command-line by using the ICACLS tool. The following example gives full access to the DefaultAppPool identity. ICACLS test.txt /grant "IIS AppPool\DefaultAppPool:F"
For more information, see ICACLS. 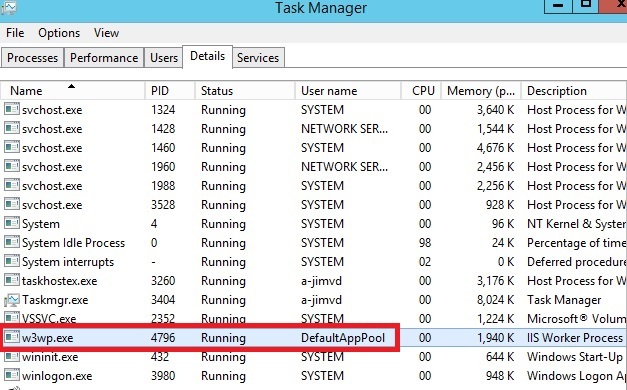 On Windows 7 and Windows Server 2008 R2, and later versions of Windows, the default is to run application pools as the application pool identity. To make this happen, a new identity type with the name "AppPoolIdentity" was introduced. 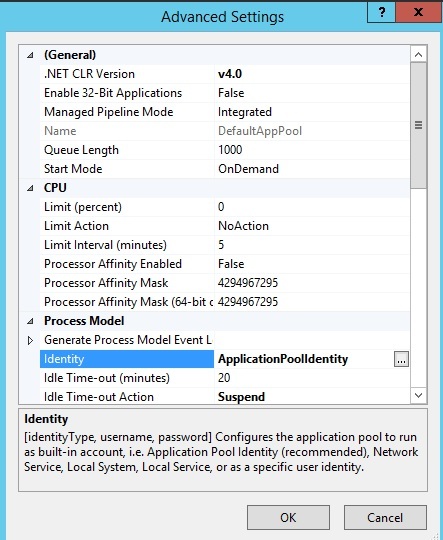 If the "AppPoolIdentity" identity type is selected (the default on Windows 7 and Windows Server 2008 R2, and later), IIS will run worker processes as the application pool identity. With every other identity type, the security identifier will only be injected into the access token of the process. If the identifier is injected, content can still be ACLed for the ApplicationPoolIdentity, but the owner of the token is probably not unique. Here is an article that explains this concept. The nice thing about this is that network resources like file shares or SQL Server databases can be ACLed to allow this machine account access. What about Application Pool Identities? The biggest compatibilty issue with application pool identities is probably earlier guidance documents which explicitly recommend that you ACL resources for Network Service, that is, the default identity of the DefaultAppPool in IIS 6.0 and IIS 7.0. 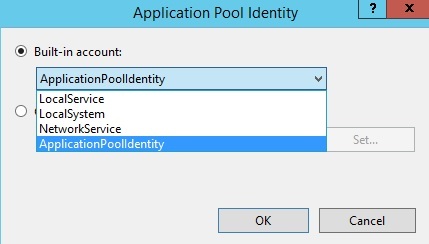 Customers will have to change their scripts to ACL for "IIS AppPool\DefaultAppPool" (or another application pool name) when running on IIS 7.5 or later (see the example above for how to do this). IIS doesn't load the Windows user profile, but certain applications might take advantage of it anyway to store temporary data. SQL Express is an example of an application that does this. However, a user profile has to be created to store temporary data in either the profile directory or in the registry hive. The user profile for the Network Service account was created by the system and was always available. However, with the switch to unique Application Pool identities, no user profile is created by the system. Only the standard application pools (DefaultAppPool and Classic .NET AppPool) have user profiles on disk. No user profile is created if the Administrator creates a new application pool. However, if you want, you can configure IIS application pools to load the user profile by setting the LoadUserProfile attribute to "true". 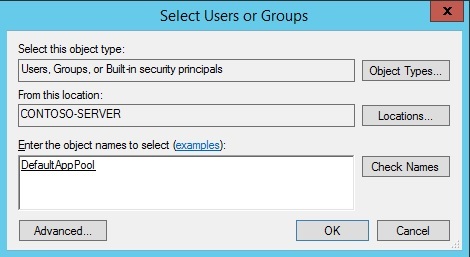 Application pool identities are a powerful new isolation feature introduced for Windows Server 2008, Windows Vista, and later versions of Windows. It will make running IIS applications even more secure and reliable.